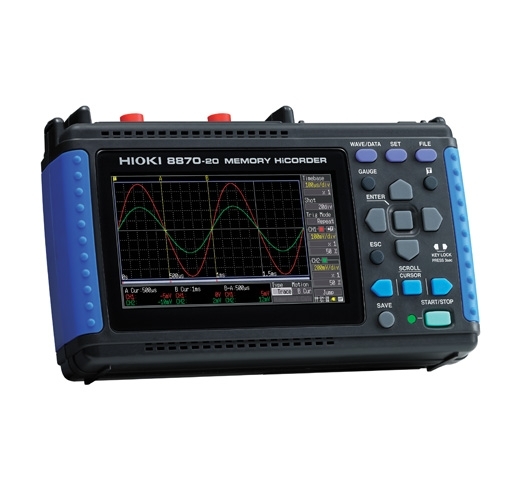 Hioki 8870-20 Memory Recorder med 2 kanaler. 1 MS/Sek. Note: Test leads are not included. Purchase the leads appropriate for your application separately. AC Adapter 9786 is the only supplied accessory. Time axis 100 μs to 5 min/div, 20 ranges,at 100 points/div resolution, three steps of time-axis magnification from 2× to 10×, and nine steps of time-axis compression from 0.5× to 0.001×. Note: The CF card installed in the HiCORDER appears as a removable disk on the PC, but communication functions such as the capability to change HiCORDER settings from the PC are not provided. 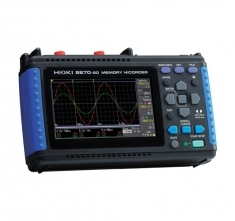 Power consumption Use with the AC ADAPTER 9786: 100 to 240V AC (50/60 Hz) 30 VA Max. Charging functions The installed battery pack charges when the AC adapter is connected. Charging time is about 200 minutes at 25°C. Notes: Charging time depends on battery condition. Charging is disabled to protect the battery at ambient temperatures out of 5°C to 30°C.